Band blade swiveling angle: +- 90 Degrees. Automatic wood infeed and outfeed. 15'' Colorful LED monitor and controller. AXIS CARD: 4 servo axes +1 set of analog voltage output +1 MPG hand wheel axis. Available to connect to various interfacing ports including Ethernet. Built-in open type PLC and Macro. 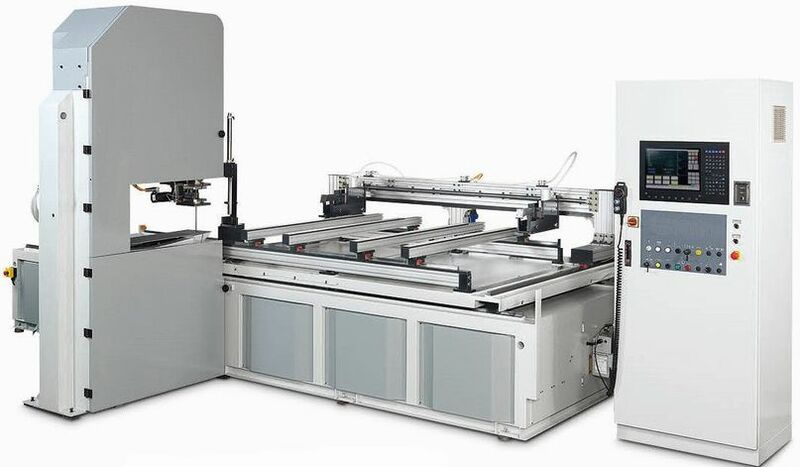 The automatic feeding mechanism is equipped with 4 grippers that grip the panels and feed it to the cutting position. The grippers are operated by air cylinder with extremely secure gripping effect. Maximum gripping thickness is 150 mm. The outfeed plate, actuated by air cylinder, automatically tilts downward to outfeed the finished products after cutting. The band blade can swivel to various angular positions through the computer control. Swiveling angles include +-90 Degrees. This combines with X and Y axis travels on the automatic feeding mechanism allows for cutting any comlicated curve. Total Hp. = 21.4 Hp. Net Weight = 6614 Lbs. Gross Weight = 7717 Lbs. Machine Dims. = 166 x 130 x 103 In.